Its population may be dwindling, but the Palestinian village of Taybeh is striving to maintain normality in the midst of conflict, and hope in the midst of oppression. Taybeh, 14 kilometres north east of Ramallah, is one of the few predominantly Christian villages in Palestine. Like villages all over the West Bank, it is suffering as many of its people decide to emigrate, seeing no other choice given the economic and physical hardship they suffer under Israeli occupation. In the 1960s the town had a population of 3,400. The population today is 1,300. Unemployment stands at around 50 per cent. But for Father Raed Abusahlia, priest of the Latin (Roman Catholic) church of Taybeh, the grim situation only adds urgency to efforts to empower the local people spiritually and economically, as he explained to an ecumenical delegation visiting the village in March. The delegation – a Living Letters team travelling on behalf of the World Council of Churches (WCC) – visited churches, ecumenical organizations and civil society groups in Israel and Palestine from 7 to 14 March. There are three congregations in the village – Greek Orthodox, Greek Catholic and Roman Catholic. The congregations worship together at Easter and Christmas, and are all actively involved in local projects. The Latin parish runs a school, a medical centre, a hostel for pilgrims, and numerous church services and youth activities. These projects are designed to give the people hope, and a reason to stay in Taybeh, says Fr Abusahlia. Its Peace Lamp initiative makes use of an abundant local product – olive oil – to promote peace and justice in the Holy Land. The lamps are produced in a workshop in Taybeh, providing jobs to 20 young men and women. The goal is to place a Peace Lamp, with accompanying olive oil and a small candle, in every church in the world, and in this way, to encourage prayer and solidarity with the people of Palestine. All revenue from the sale of the lamps goes to charitable organizations like the Caritas medical centre and Beit Afram, Taybeh's home for senior citizens. Around 50 young people aged between five and 15 sing in the parish youth choir. The choir has produced a CD called With One Voice, and in 2006, eight children from the choir participated in a musical tour of France, performing 14 concerts throughout the country. Around 100 groups of pilgrims visit Taybeh each year. Fr Abusahlia says that visitors can play an important role in breaking down the stereotypes that exist about Israel and Palestine. "Maintaining the Christian presence in the Holy Land is the responsibility of all the Christians in the world," he said. "When people visit, they can see that Taybeh is a place of peace. We encourage them to talk about Taybeh to their friends and family when they return home, and promote products like our Peace Lamps. That is the best sign of solidarity." Nancy Adams, a member of the Living Letters team from the Scottish Episcopal Church, said the Peace Lamp that she took away from Taybeh was a powerful symbol of peace, and a reminder of the courage of the people she met there. She has already had opportunities to talk about her experience in Taybeh with church groups in Scotland, using the Peace Lamp as a focal point. "I told them of many of the sorrows I had heard, seen and experienced. But I was also able to share with them the joy of the inspirational work going on in Taybeh," she said. "Another message I took home from Taybeh is that Christians, Muslims and Jews working so desperately for peace depend upon the international community to reignite the flame of peace with justice for the people of Palestine and Israel." David Khoury, mayor of Taybeh, remains hopeful of peaceful coexistence between Israelis and Palestinians. Khoury is also co-founder of the Taybeh Brewery. Palestine's only brewery, it was established in 1995 and now runs under license in Belgium, exporting from there to other European markets. In 2007, a non-alcoholic beer was launched. Each year the brewery runs an Oktoberfest celebration featuring local musical and dance acts. Khoury says that while business is stable at the moment, there have been difficult patches – particularly after the beginning of the second intifada, when the business almost closed. Road closures and checkpoints are a daily reality, and while Israeli products, including beer, flow tax-free into the West Bank, Palestinian export products can be delayed for hours at checkpoints and often sent back, meaning no income is made that day. Khoury and his brother Nadim – both born in Taybeh – had been living in Boston for 20 years when they decided to return to Palestine to set up the brewery. "We came back to Taybeh because we wanted to contribute to the economy," said David Khoury. "Palestine had never had its own brewery before – we wanted to provide local beer to the people, and to travellers to the area. Now tourists come every day to Taybeh. We're proud that we come from this little village." Taybeh is one destination on the itinerary for the Alternative Tourism Group, a Palestinian non-government organization specializing in tours and pilgrimages that provide a critical examination of the history, culture, and politics of the Holy Land. It works to encourage tourism operators to abandon exploitive mass tourism and to adopt practices that are beneficial for the local population. It seeks to promote a positive image of Palestine and its people, and to contribute to the establishment of a just peace in the area. The Alternative Tourism Group is part of the Palestinian Initiative for Responsible Tourism, a network of organisations in the Holy Land working to overcome some of the difficulties and threats that the Israeli occupation poses to tourism, to promote a balanced and enriching experience for travellers and to achieve a more equitable distribution of tourism revenue. These organisations have developed a Code of Conduct for Tourism in the Holy Land, which provides guidelines both for travellers to the Holy Land and for the Palestinian tourism sector. He is realistic about the challenges facing the village. 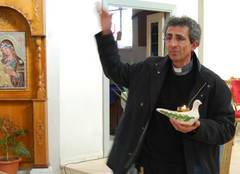 "Very soon we'll have empty churches in Taybeh," said Khoury. "The moment people have a chance, they leave. They are sick and tired of the way things are." But he hopes that activities like the brewery can provide some hope to the people of the region. "The Palestinian people live on hope. We're determined that we want to live in peace, and stay in this Holy Land."